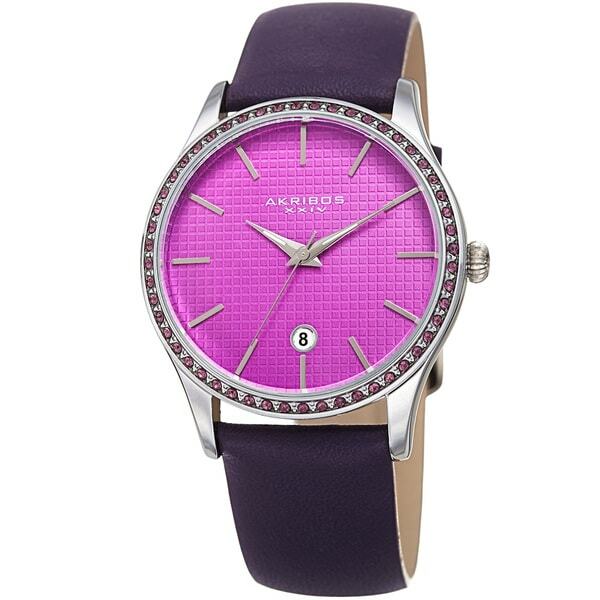 This stylish women's timepiece from Akribos XXIV is adorned with sparkling Swarovski crystals set into the bezel. It features hand-applied stick markers on a textured checkered dial. The lovely leather strap will add a splash of color to your attire. This watch is a comfortable and attractive addition to any wardrobe. The genuine leather band softens over time without cracking or stretching. The watch is lightweight and easy to set. I enjoyed wearing this watch and would consider buying at the correct price. It has become an effective, time keeping companion. I am very pleased with this watch. Purple is my favorite color and this watch looks great. Thank you overstock for the price and for the look and style of this watch. Beautiful color and quality at it’s finest. I have received multiple compliments while wearing my new stunning watch. It matches multiple shades of Lavender and purple.